Joel Birch, vocalist of The Amity Affliction, was hospitalized today due to an unspecified illness, which also forced the band to cancel their scheduled appearance at yesterday's Warped Tour stop in Pittsburgh. Rather than cancel again, the band chose to perform today at the Cleveland Warped stop with the help of Sam Carter (Architects), Jason Aalon Butler (letlive. 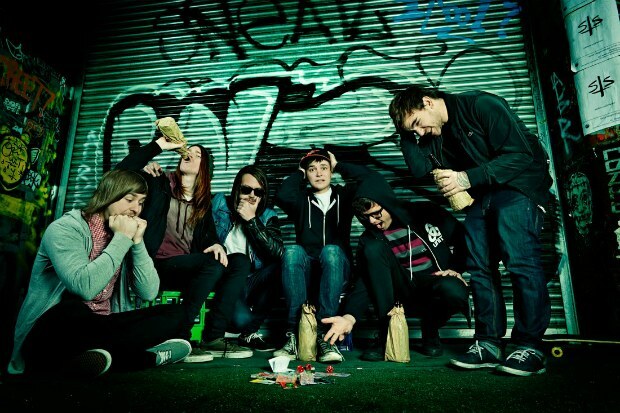 ), and Chris Roetter (Like Moths To Flames), trading off on vocal duties. We've reached out to the band for further comment on the details of Birch's condition, and will update once we know more about the situation. According to the band's statement, Joel was hopeful to perform at tomorrow's Detroit stop, but, in light of the singer's hospitalization, the prospect of that remains unclear. It has been a hazardous Warped Tour for The Amity Affliction. Drummer Ryan Burt sustained an eye injury during the band's Portland, Ore. performance last month, and was replaced by Chad Hasty, of Glass Cloud. The group are scheduled to appear on the entirety of Warped Tour.